The Panigale V4 has been developed in close collaboration with Ducati Corse, drawing directly on know-how and technology from the racing world to provide a road bike that is the closest thing possible to its MotoGP counterpart. The Panigale V4. A bike that begins an exciting new chapter in the Ducati story, a new “symphony” of all-Italian performance and emotion. The Panigale V4 is the first production Ducati motorcycle to mount a four-cylinder engine, derived directly from the MotoGP Desmosedici. It’s a concentrate of Ducati technology, style and performance. With an engine displacement of 1,103 cm3, 214 hp and a power/weight ratio of 1.1 hp/kg, this bike sets a new standard in the supersport production bike segment and for 2019 is also available in the new livery Corse, inspired by the colors of the bikes that race in MotoGP. The Panigale V4 replaces the iconic 1299 at the top of the Ducati superbike range, doing so by enhancing performance and ridability so that riders of all skill levels can enjoy boundless fun and excitement. The new Ducati superbike family consists of the Panigale V4 – the essence of the new sports bike – and the Panigale V4 S. The latter mounts Öhlins suspension featuring the Smart EC 2.0 system with a new adjustment interface and top-drawer components such as forged aluminium wheels and the lithium ion battery. Completing the range is the exclusive Panigale V4 Speciale, a numbered, limited-edition bike with a dedicated livery, titanium exhaust and machined from solid components. The Panigale V4 engine is the only one in the sports segment with a 90° V configuration. It’s also the only engine to use technology such as the counter-rotating crankshaft and twin pulse ignition. These solutions have a positive impact on bike dynamics, making it more agile during changes of direction, fast and stable on the straight and ensuring easier out-of-the-corner torque handling. 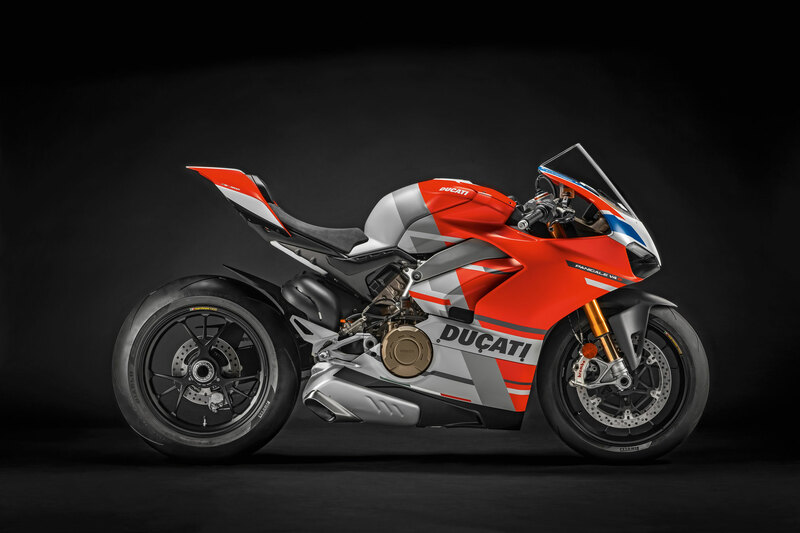 The already high power of the standard Desmosedici Stradale configuration can be boosted to 226 hp by mounting the all-titanium racing exhaust, made by Akrapovič as per Ducati Corse specifications. 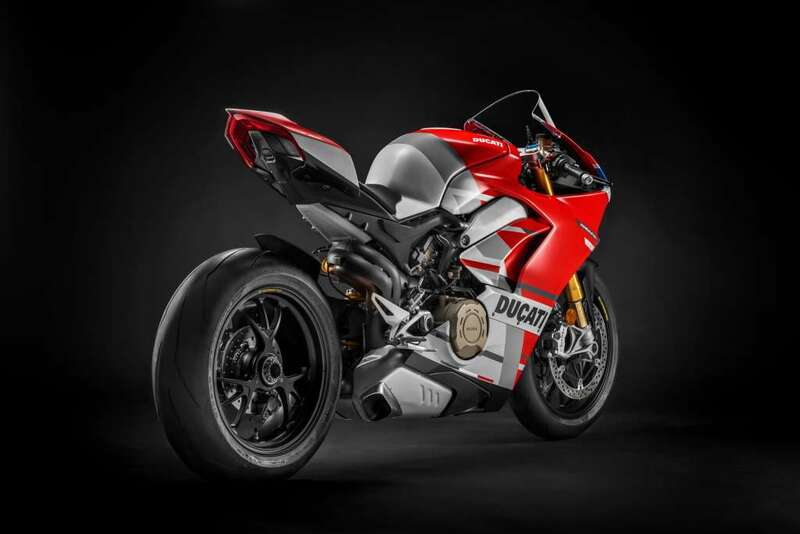 To contain the inevitable weight gain with respect to the 1299 Panigale (because of the 4 cylinders) Ducati has developed an all-new frame where the Desmosedici Stradale itself has a load-bearing function. Called Front Frame, it’s more compact and lighter than a perimeter frame and uses the engine as a stressed chassis element. This solution ensures the right torsional rigidity for on-the-edge riding and gives riders outstanding “feel”. The Front Frame has allowed the designer to create a bike that is slender in the tank-seat merge zone: this, together with seat/handlebar/footpeg triangulation, ensures perfect bike-rider integration. Together with meticulous design and the use of light materials, the new frame keeps the kerb weight of the S and Special versions down to 195 kg. This weight, combined with the 214 hp, means a power/weight ratio of 1.1 hp/kg, putting the Panigale V4 S at the top of the sport bike segment. The Panigale V4 doesn’t just set new performance standards. Thanks to the potential of the six-axis Bosch inertial platform, a latest-generation electronics package with some previously unseen features defines new active safety and dynamic vehicle control standards in all riding situations. The Panigale V4 introduces controls such as controlled drift during braking, ABS Cornering on the front wheel only thanks to a set-up specially designed for track riding and Quickshift Up & Down with a strategy that takes lean angles into account. All these controls – developed on the track together with official Ducati riders and test riders – are incorporated in the three new Riding Modes (Race, Sport and Street) and can be adjusted via the advanced TFT panel that makes the Panigale V4 the highest-tech bike in the category. 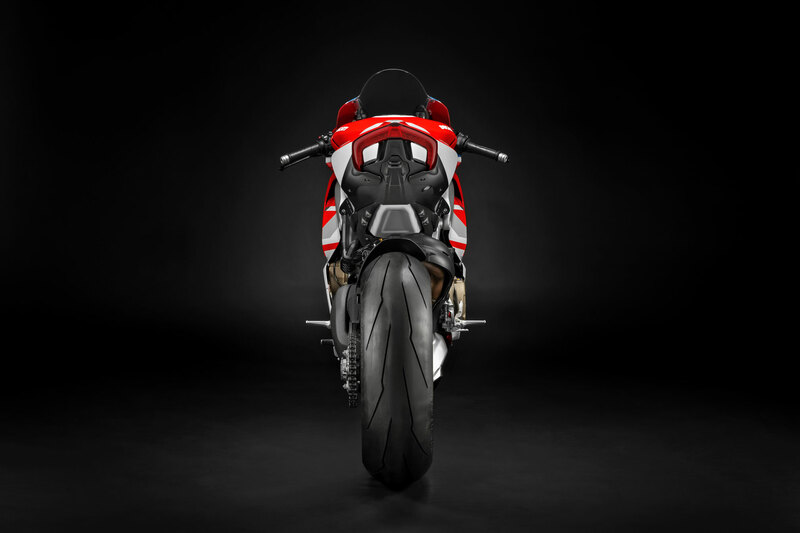 Ducati sees the 90-degree V4 layout as the pinnacle of motorcycle engine sports performance. It’s no coincidence that this same solution is employed on Desmosedici MotoGP engines. The 90-degree V layout evens up first order forces naturally without having to resort to a balancing countershaft to eliminate vibration, a solution that, as is known, increases weight and drains power. This key benefit, crucial to the reliability and mechanical efficiency of an engine that revs as high as 14,000 rpm, is just one of many that make this Ducati-selected configuration the most technically refined possible. Compared to a classic in-line 4, the lateral compactness of the V arrangement allows for better mass centralization and reduces the bike’s frontal cross-section. Moreover, the shorter crankshaft diminishes the gyroscopic effect. All these aspects have a positive impact on motorcycle dynamics, making it lighter and faster when changing direction. Ample space inside the V provides room for both the water pump and an outsize airbox (12.8 litres) that lets the Desmosedici Stradale breathe better. Smooth integration of engine and chassis set-up forms the foundation of every Ducati. That’s why the Desmosedici Stradale is designed to be banked rearward 42°, just like the Ducati engines used in MotoGP. This optimises weight distribution, allows for larger radiators and brings the swingarm pivot as far forward as possible. Moreover, the Desmosedici Stradale has been designed as a structural chassis element. The main frame attachment points have been incorporated in the front of the upper crankcase half and in the rear cylinder bank head. What’s more, the crankcase acts as a rear suspension and swingarm attachment point. 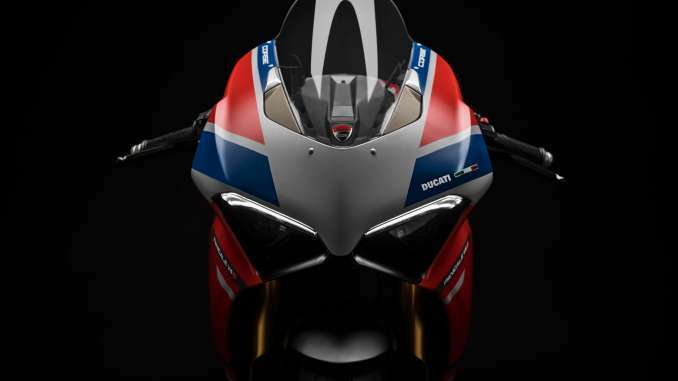 Synergies with Ducati Corse has yielded a compact, light, high-performance engine. Meticulous design and development by Ducati’s engine team has resulted in power delivery that maximises road riding pleasure and gives supreme track performance. Of course, this layout demands the addition of the so-called ‘jackshaft’ (*) to transfer crankshaft drive through the gearbox to the rear wheel so it turns the right way. A combination of 70° crank pin offset and 90-degree V layout generates what Ducati calls a “Twin Pulse” firing order because it’s as if the engine were reproducing the firing sequence of a twin-cylinder. The distinctiveness lies in the fact that the two left-hand cylinders fire closely together, as do the two right-hand ones. In the timing chart, the ignition points are, then, at 0°, 90°, 290° and 380°. It’s this particular firing order makes the V4 sound like a MotoGP Desmosedici. Each throttle body has two injectors: a sub-butterfly one for low-load use and another above it that comes into play when maximum engine performance is required. The throttle bodies of each cylinder bank are moved by a dedicated electric motor. Thanks to the full Ride by Wire system, this allows complex electronic control strategies and modulation of engine ‘feel’ according to the selected riding mode. As on all Ducati engines, the Desmosedici Stradale sees Desmodromic design playing a pivotal performance role. On the Desmosedici Stradale, the Desmodromic system uses fully redesigned, miniaturised components that have allowed for the construction of very small cylinder heads, achieving a degree of sophistication, lightness and compactness never before seen on a Ducati. Every single system component has been designed and tested to operate safely at the high revs the V4 is capable of. New spark plugs – smaller than standard models – also help keep the heads compact. Given the high revs attained by the V4 and the large valves, a traditional spring system would be inadequate because the valves would be unable to follow the steep cam profiles. This, then, is where the Desmodromic system becomes a must. With the “Desmo” system the valves are closed mechanically with the same level of accuracy as they’re opened. This allows the steep cam profiles and radical cam timings that optimise intake and exhaust fluid dynamics to provide higher engine performance. The oil tank – which also acts as a filter housing – is in a magnesium sump mounted underneath the crankcase and connected to the gearbox but separate from the crankcase. A dedicated radiator, attached just below the water radiator, cools the oil. Housed in the engine ‘V’, the water pump is operated by a shaft, in turn driven by a gear train. This positioning solution is designed to minimise circuit size, boost efficiency and optimise engine weight. 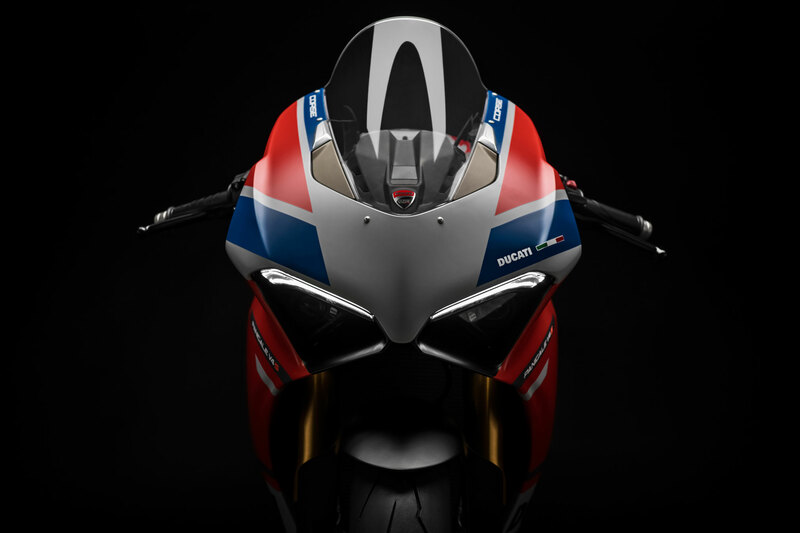 The motorcycle’s bodywork develops around the technical parts, and in particular, the new “Front Frame” left exposed, with the two pillars extending laterally to the Desmosedici Stradale cylinder heads. The front is dominated by two large airbox air intakes, which incorporate the full-LED headlight in the top part, overshadowed by the ports. The headlight sizing is reduced with the precise aim of enhancing the aggressive look of the two oversized ports, especially when the engine is switched off. Below the air intakes are two wing attachments designed to accelerate the incoming airflow. The full-LED headlight includes a Daytime Running Light outlining with a double-edged profile the top of the air intakes, and two compact LED modules ensuring low-beam and high-beam functions. The tank has a shape designed to support the rider during track riding and stretches out to below the seat – just like in racing models. This feature is highlighted by exposing the tank in the tail area. The tail is made of two shell-cast aluminium half-shells, which starting from the rear cylinder head, reach out to hug the tank part below the seat, ending up in the single-seater one-piece tail end, whose wing-shaped design is inspired by the shape of a car spoiler. The tail faring integrates the full LED light that is also wing shaped: although a single piece, it features the signature split lighting typical of Ducati racing models. The most important advantage offered by the Ducati “Front Frame” is that the Desmosedici Stradale engine can be used to achieve the required rigidity, making it possible to significantly reduce the outreach, and consequently, the weight, of the main frame, resulting in a better rigidity/weight ratio. Another plus is the fact that the reduced length of the pillars running alongside the engine has resulted in a more compact motorcycle design – especially in the rider seat area. development step: all the riding items related to handling, from rider feedback through support solidity to safety feeling and grip loss predictability, have been optimised by creating a new front profile, slightly increased in terms of maximum section width with respect to the previous version of the product. Redesigning the geometries of the semi-finished products and the belt pattern has made it possible to set new agility and rideability standards, with at the same time top racing level performance. Finally, the new tread pattern of the DIABLO™ Supercorsa SP features a new “flash” geometry to optimise track performance by improving wear, and reduced groove widths designed to provide adequate support for stronger side thrusts. The Panigale V4 range is fitted exclusively with the brand new Brembo Stylema® monobloc calipers – the latest evolution of the already high-performance M50. The new Stylema® calipers, machined from a single piece of alloy, feature lighter-weight areas in the fixing bushings and in the body, which, compared to the M50, make them visually more compact – allowing at the same time a weight reduction of 70 g for each caliper, without compromising on rigidity. Other improvements have been introduced in terms of internal ventilation to ensure higher efficiency. The twin Brembo calipers each have four 30mm pistons that grip 330mm discs to achieve outstanding braking performance – with at the rear a single 245 mm disc with a 2 piston caliper. The braking system is supported by the ABS Cornering EVO system, which uses the extra-lightweight 9.1MP Bosch control unit. The Panigale V4 not only sets new benchmarks in terms of top performance, but also defines new active safety standards and vehicle dynamics control – thanks to a state-of-the-art electronic package, based on the use of a 6-axis inertial platform (6D IMU – Inertial Measurement Unit) that instantly detects the motorcycle’s roll, yaw and pitch angles in space. The operating parameters of each control are factory-associated with the three Panigale V4’s signature Riding Modes. The rider can customise his or her riding style and restore Ducati’s factory settings. The level of one of the DTC, DWC, DSC or EBC control functions can be quickly adjusted via the direct access buttons provided on the left-hand switchgear. The Bosch ABS system, equipped with a “Cornering” function that extends ABS action to situations in which the vehicle is leaning in corners, has undergone a major evolution to reflect the latest action logic and types of control. The ABS Level 1, recommended for track riding, is activated while maintaining the “Cornering” feature – for extremely hard braking into corner and to help rectify any rider mistakes. The DTC EVO featured by the Panigale V4 is based on an algorithm that makes intervention faster and more accurate. The DTC EVO interfaces with the Bosch Inertial Measurement Unit (IMU), constantly monitoring the vehicle’s lean angle and using it to accurately calculate the degree of intervention needed to ensure suitable rear wheelspin (according to the DTC EVO level setting). With simpler types of traction control, detection of rear wheelspin sees the system kick in to hold it in check. When optimal grip is re-established, the system reduces intervention until spin reoccurs, and the cycle repeats. This produces a graph that shows intervention oscillating around a theoretical “ideal intervention line” that represents the traction limit. The DTC EVO reduces the magnitude of those oscillations, making the system operate closer to the perfect intervention line. This kind of behaviour is highly advantageous as its effect on the dynamic balance of the motorcycle is minimal. In addition, the system is designed to be stronger and more consistent, allowing the motorcycle to maintain constant and predictable behaviour even when the grip level changes – i.e. in case of rear tyre wear. In addition to this enhanced intervention precision, when set to level “1” or “2”, the DTC EVO introduces a new function, named “spin on demand”, allowing the rider to control the motorcycle up to levels that would previously only have been possible for experts or pros. Now, when the machine is leaned over, the rider can use the throttle to request more wheelspin than that obtained at the normal intervention level, allowing the motorcycle to pivot around its front wheel and close the cornering line. The DTC EVO allows riders to do this while keeping safety parameters under control, effectively letting them ‘close’ the cornering line with the rear wheel. The introduction of the 6D IMU has allowed the Ducati Slide Control (DSC) – developed in conjunction with Ducati Corse – to be added to the Ducati Traction Control EVO (DTC EVO). This new system provides the rider with further support by controlling the torque delivered by the Desmosedici Stradale engine as a function of the slide angle; its goal is to improve out-of-the-corner performance by preventing slide angles that might otherwise be difficult to handle. The DSC relies on the 6D IMU that provides the vehicle control unit with crucial information on vehicle dynamics (such as lean angle, acceleration and much more). Thanks to these data – and depending on the user-selected level – the DSC extends the performance range of the motorcycle for everyone, providing improved assistance under extreme riding conditions. The Panigale V4 also comes equipped with the latest version of Ducati Wheelie Control EVO (DWC EVO). This system, using Bosch 6D IMU information, ensures wheelie control to obtain top acceleration performance in a smooth, safe manner. The DWC EVO detects the occurrence and extent of wheelies to control them with a higher level of precision – ensuring a more accurate response to rider input. This 3-level adjustable system ensures lightning-fast starts, letting the rider focus only on releasing the clutch. Once set, the rider simply engages the first gear and opens the throttle. During the first stage of starting off, while the rider is modulating the clutch release, the DPL stabilises the Desmosedici Stradale at optimal revs as a function of the selected DPL level. In the second phase, when the clutch has been fully released, the DPL controls torque delivery to ensure the maximum degree of acceleration according to the chosen level. The DQS EVO, as well as minimising gear shifting times, allows down-shifting without using the clutch – ensuring even more effective hard braking. The system consists of a two-way microswitch built into the linkage of the gear change lever; each time that the gearbox is actuated, it sends a signal to the Desmosedici Stradale ECU. The system works differently for upshifts and downshifts, integrating adjustment of the spark advance and injection during upshifts with a controlled opening of the throttle valve during downshifts – ensured by the full Ride-by-Wire system management. The “S” and Speciale versions are equipped with the event-based electronic control Öhlins suspension system, based on the second-generation Öhlins Smart EC (Electronic Control) system which, in addition to leveraging all the potential offered by the 6D IMU, has a new and more intuitive rider interface, OBTi (Objective Based Tuning Interface). The electronic suspension offers the choice between manual mode (“Fixed”) – allowing compression, rebound, and damping of the steering damper to be manually set via “virtual clicks” (32, from fully open to fully closed, for the suspension, and 10 for the shock absorber) – and automatic (“Dynamic”). When the “Dynamic” mode is selected, based on the information received from the 6D IMU and other sensors, the system automatically adjusts compression and rebound damping in response to the riding style. The main advantages offered by the Öhlins Smart EC 2.0 system concern the rider’s option to customise the level of intervention on the suspension, depending on individual riding events (braking, cornering, acceleration), as well as to adjust the operating parameters of individual hardware components. For the rider, this means having access to a superior level of motorcycle dynamics control – improving road safety and track lap time efficiency. The Riding Modes allow the rider to choose from three different factory-set riding styles, perfectly adapting the Panigale V4’s behaviour to the rider’s, to the track type, and to environmental conditions. Each Riding Mode is programmed to instantly change the engine’s character, electronic control parameters and, in the “S” and “Speciale” versions, also the suspension set-up. Each rider can customise his or her riding style and later restore Ducati’s factory settings. Riding Mode Race – As the name implies, the Race RM has been developed for experienced riders who wish to make the most of all the potential of the Panigale V4 on high-grip track surfaces. By selecting Race, the rider can rely on 214 HP, with direct Ride-by-Wire throttle response and, on the ‘S’ and Speciale versions, a high-performance hard suspension set-up. The Race mode implies a low-intervention default electronics setting, without, however, compromising on safety, with the ABS only intervening on the front wheel to provide maximum braking performance, but with the Cornering feature always active. Riding Mode Sport – By selecting the Sport Riding Mode, the rider can count on 214 HP power delivery with a sporty Ride-by-Wire response to throttle opening and, in the S and Speciale versions, an equally sport-oriented suspension set-up. Electronic controls are set in such a way as to help also less experienced riders adopt an effective, highly spectacular riding style. In the Sport mode, for instance, the controlled braking drift feature is active, allowing for safe wheel skidding when turning into corners. The rear wheel lift control function is active and the ABS Cornering function is set to provide maximum cornering performance. Riding Mode Street – The Street Riding Mode is the one recommended for road use of the Panigale V4. This RM offers the rider 214 HP power delivery with progressive Ride-by-Wire response to throttle opening, like in the Sport RM, and, in the Panigale V4 S and Panigale V4 Speciale versions, an extremely soft suspension set-up to absorb any bumps in the road. The default setting of electronic controls helps ensure maximum safety, by guaranteeing the best grip and stability. of lay-out and up-to-date graphics, and even more alluring. In developing the motorcycle’s instrumentation, the main focus was on readability and easy access to functions. The most visible element of the brand new dashboard is the “virtual” circular rev-counter, located on the right side, a clean break with past equipment tradition, inspired by high-end automotive production. The Desmosedici Stradale revs are displayed in the 1,000 to 15,000 rpm range via a needle indicator, whose motion is highlighted by a white trail acting as a “shiftlight”, changing from white to orange and then going red when approaching the over-rev area. Two different layouts are available to – and can be recalled by – the rider: the “Track” display, which focuses attention on the lap time indication and in which the rev counter scale highlights the engine rpm values related to the track-specific range of use; and the “Road” display, which instead of lap times, shows Ducati Multimedia System (DMS) information, and highlights engine rpm values typical of road riding. For improved readability, the indications of the (digital) top speed, selected Riding Mode, and selected gear do not change position when the selected lay-out is changed. The Panigale V4 dashboard, in addition to the classic menu including total kilometres, Trip 1, Trip 2, fuel consumption, average fuel consumption, Trip Fuel, Trip Time, Average Speed, Air Temperature, Lap On/Off (in “Track” mode only), and Player On/Off (in “Road” mode only), also features another menu in the bottom right corner with two available functions: display/indication of parameters related to the selected Riding Mode or quick changing of DTC, DWC, EBC and DSC parameters. Finally, the Panigale V4 has an “auto off” function for its direction indicators: the indicators will go off automatically after riding out of a corner or, if pressed unintentionally, after a few hundred metres on a straight stretch (variable between 200 and 2000 metres depending on the current speed of the vehicle when the indicator button is actuated). The DLT GPS allows lap times to be automatically recorded, stored and displayed directly on the dashboard each time the finish line is crossed – providing the rider has previously entered the finish line coordinates, by pressing the light flasher button. The system has a useful “Best Lap” feature that displays the lap time flashing for 5 seconds if it is the best recorded lap time in the current track session. For each lap, and for a total of 15 consecutive laps, the lap time, max rpm and top speed are stored; this information can be viewed on the dashboard by accessing the special menu. The DLT GPS is part of the standard equipment on the Panigale V4 Speciale and is available as a Ducati Performance plug-and-play accessory for the Panigale V4 and Panigale V4 S.
The Ducati Data Analyser + GPS (DDA + GPS), evaluates the performance of the motorcycle and its rider by graphically presenting specific channels of information. The DDA + GPS is an essential piece of equipment for track use: it monitors the rider’s performance, in addition to automatically recording and displaying lap times whenever the Panigale V4 crosses the start and finish line. It stores a number of data channels including throttle opening, vehicle speed, engine rpm, gear selection, engine temperature, distance travelled, revs and DTC index. DDA + GPS is available as a Ducati Performance plug-and-play accessory, while it is supplied as standard with the Speciale. The Panigale V4’s versatility is demonstrated by a pre-setting for the Ducati Multimedia System (DMS) – allowing the rider to accept incoming calls, select and listen to a music track, and receive SMS notifications thanks to Bluetooth technology. When the rider gets on the motorcycle, his or her smartphone automatically connects to the vehicle via Bluetooth, allowing the rider to handle the main multimedia features. The TFT display shows the played track, the icon indicating new incoming SMS or the name of the caller. The call or music sound are transmitted to the rider’s helmet earphones. The DMS is available for the entire Panigale V4 range as an accessory.